Once safety check is done by the PESO, manufacturers can go ahead with the production of green crackers. Union Environment Minister Harsh Vardhan on Monday said although less-polluting "green crackers" have been devised and the technology will be shared with the industry soon, it will not be available this Diwali. The technology for fireworks with low emission levels was developed by the National Environmental Engineering Research Institute (NEERI) of the Council of Scientific and Industrial Research (CSIR), Dr Harsh Vardhan said while speaking to reporters. The green crackers manufactured were sent to the Petroleum and Explosives Safety Organisation (PESO) for safety checks and granting licences to the manufacturers. "Obviously, they will not be available for this Diwali. But once granted licence by PESO, factories like those in Sivakashi will begin manufacturing and these will be available for use on all occasions including weddings throughout the year," the minister said. Once safety check is done by the PESO, the manufacturers can go ahead with the production of green crackers. In 2016 and 2017, the Central Pollution Control Board (CPCB) had found presence of high levels of toxic elements like barium and aluminium in Delhi's air a day after Diwali. The new technology, according to Dr Harsh Vardhan, will have 20 to 30 per cent less particle pollutants. Several highly toxic elements used in conventional fireworks like potassium nitrate and sulphur have either been reduced or replaced in the new technology, he added. "The green crackers use less levels of potassium nitrate. It replaces aluminium with less toxic magnesium... In some products, we have also reduced the quantity of magnesium. "Highly toxic barium has been eliminated with zeolite which are made by modifying the flyash. The barium emits light which zeolite also does, but toxicity is much less. They have reduced carbon as well... NBRI in Lucknow is working on plant-based materials which could be used in fireworks," the minister said. He added that while manufacturing techniques will remain the same for the factories, the cost of manufacturing in case of green fireworks will come down by 15 to 30 per cent. Stating that all this was achieved within the last year, the Minister said he is surprised to know that there was no such facility to test the emissions from firecrackers in India. Dr Harsh Vardhan said that a first-of-its-kind testing facility was developed at NEERI in Nagpur, where the modified chemical combination was tested to modify and control the emission with colours, smoke, height of lighting, brightness and ability to burst. The Tamil Nadu Fore Crackers Association was involved in this experiment. 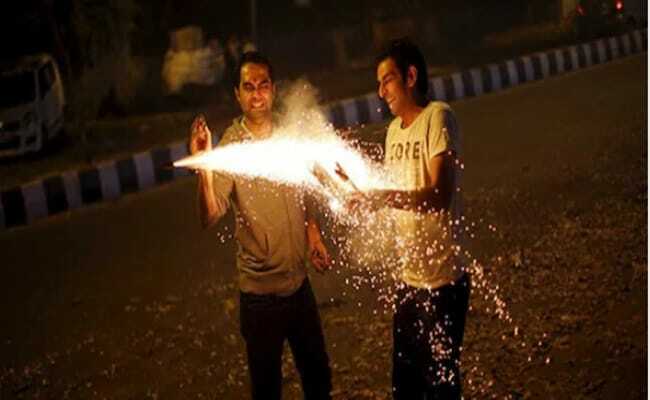 The Supreme Court on October 23, two weeks before Diwali, restricted bursting of toxic firecrackers and allowed only "green firecrackers" on Diwali and other occasions.